As a new parent there are so many things that need to be bought. I found with each baby I had that things changed and there were so any new products on the market. 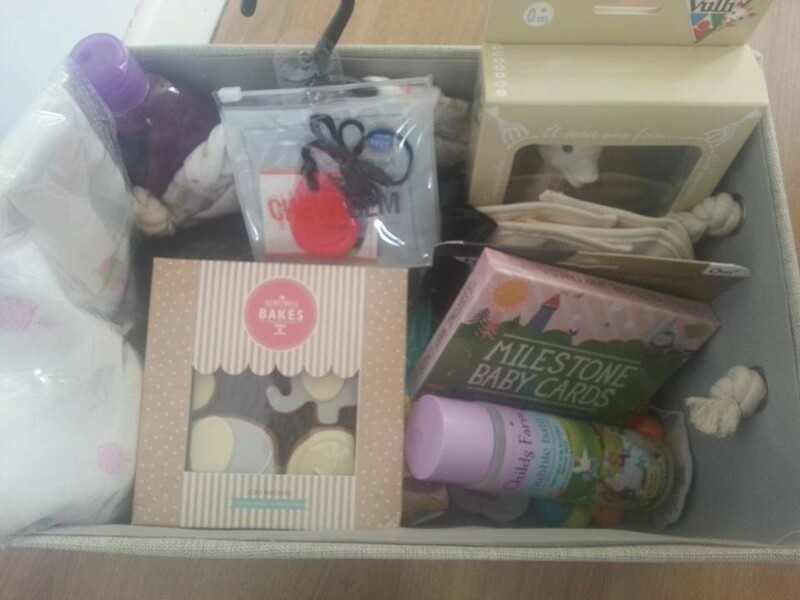 I decided to put together a new baby gift guide to showcase some products which have caught my eye on the baby product market recently. 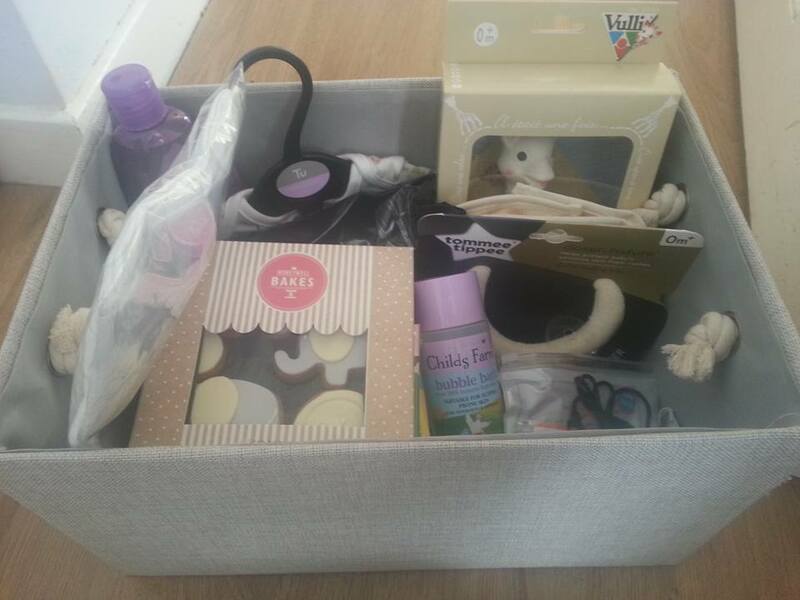 With lots of friends and family expecting new babies in the coming months I wanted to see what there was on the market at the moment that could be included in a new baby gift basket. 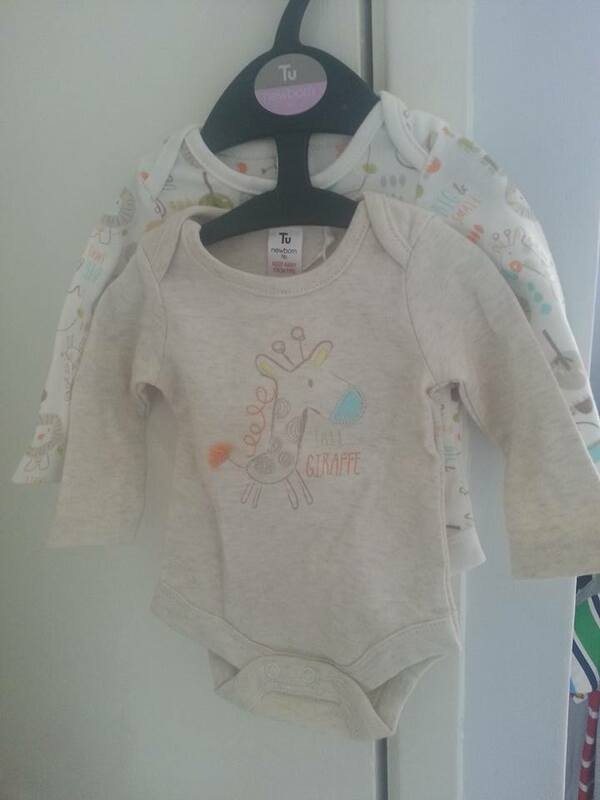 Our youngest is nearing 6 years old and as much as I try and keep in the loop on baby products it is sometimes hard to keep up with all of the newest baby items and products that there is to buy. Our gift basket ready and waiting. 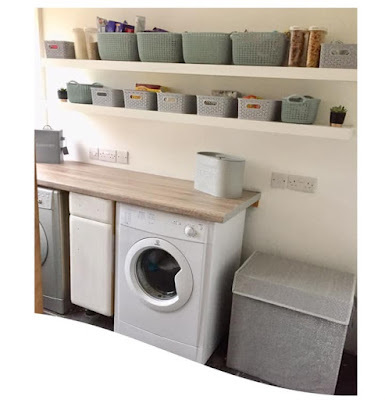 The basket can be used afterwards for more baby items and storage around the home. 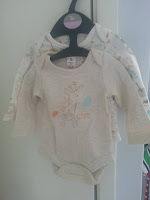 The long sleeve baby vests were from the Tu collection at Sainburys. Whilst putting a new baby gift basket together recently I was sent some wonderful products from some great baby companies. As well as putting in the usual (and essential!) pack of nappies, Johnson's lavender bubble bath, some Child's Farm bubble bath, a long sleeved baby vest and some wooden baby toys I was also sent a wonderful selection of items too. First up is the very popular Sophie la Girafe. 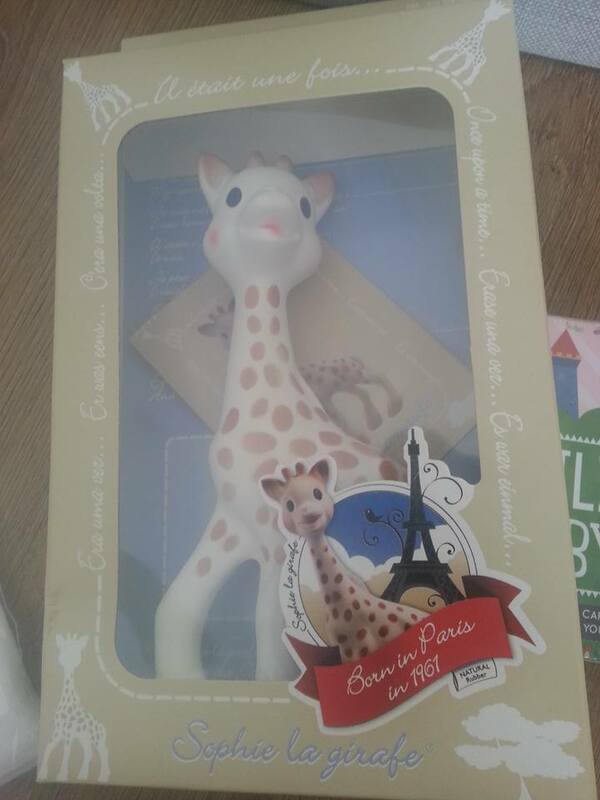 Sophie la Girafe is a rubber squeaky teething toy that was created in 1961. Covering all 5 senses when it comes to baby play she is loved all over the world. 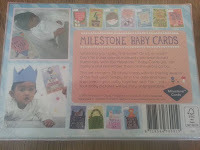 We were also sent some milestone cards. 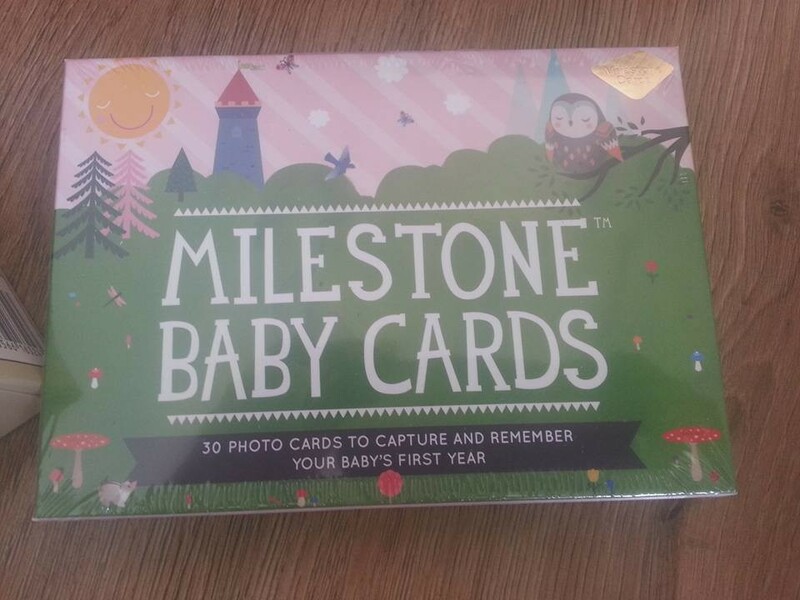 These are also becoming very popular and are great for capturing every milestone as they happen. 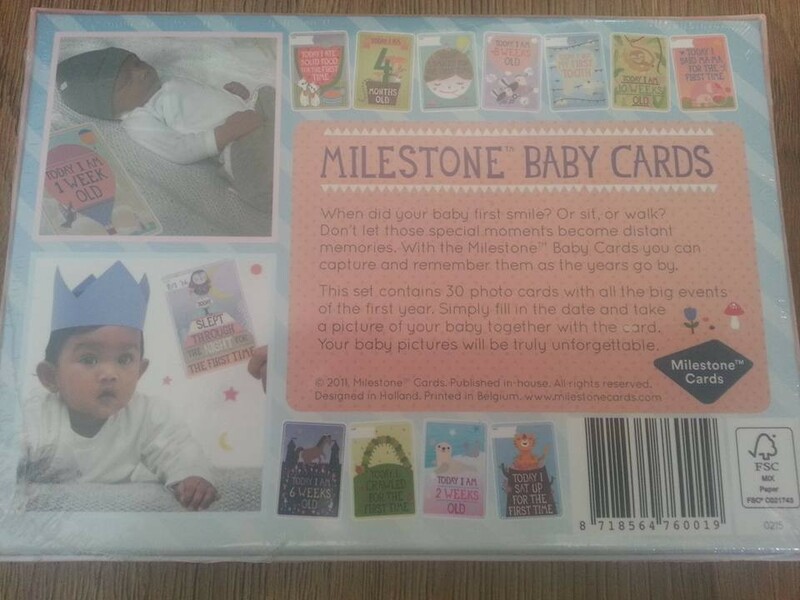 Each card has a different milestone or age printed on them in a colourful design and can be used in pictures to capture an event in babies growth and development. 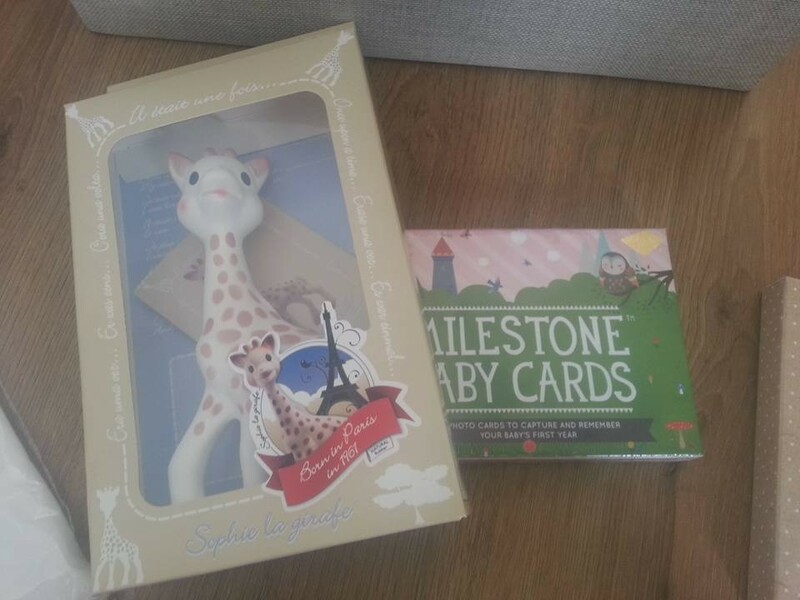 Both item were kindly sent by and can be purchased from Sophie la girafe. Next I had a lovely pendant necklace sent from Gumigem. This is a company who I had heard of but didn't realise how many wonderful products they had to choose from on their website. From hearts pendants to cat pendants, beads, tubes, dad tags, toys and more there is something for everyone. 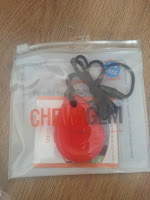 We were sent the Raindrop Pendant in a vibrant orange colour. 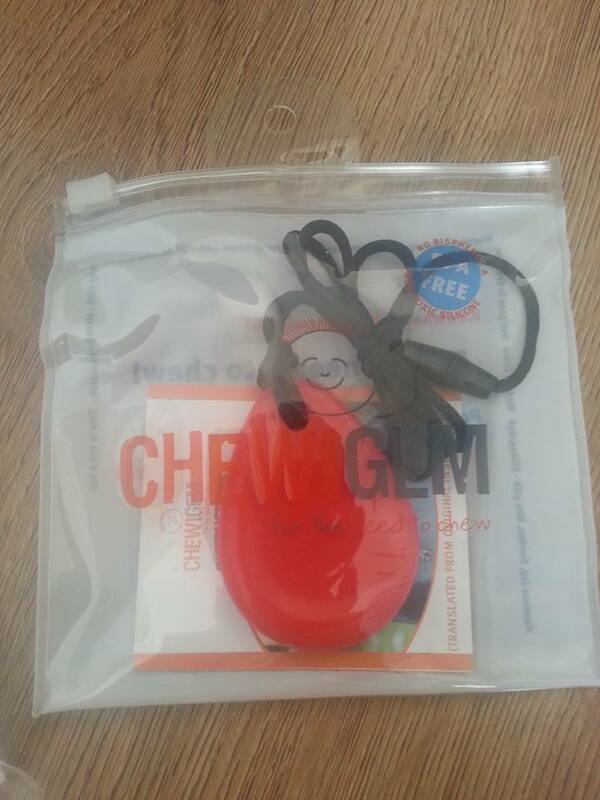 The pendant is BPA, lead, latex, phthalate free silicon jewellery. This pendant can be worn by Mum, Dad, grandparents etc... and then baby can interact and chew on the pendant. Prices vary across the extensive product range. The raindrop pendant is £12.95. Head to their website to check out the full range on offer. The fab people at Twisted Twee sent us a baby vest from their Film Buff Stuff range. Cute little baby vests with popular movie quotes on them. 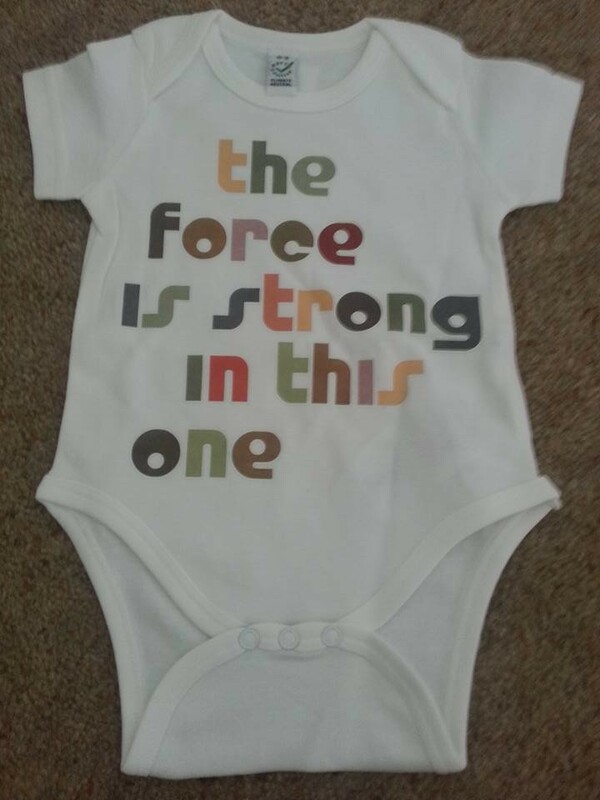 We were sent the 'The Force is Strong in this one' vest. With long or short sleeves its ideal to wear with a pair of trousers. The quotes are lovely and vibrant in colour and there are a few movie quotes to choose from. The vests are handprinted and made from soft organic cotton in white or cream . Priced at £16 they can be found in the kids section of the website. These are an ideal choice for baby clothing that's a bit different from the norm. Along with the matching Pint and Half Pint twin sets this is a must visit website for the perfect baby clothing gift. Muslin swaddles. For any expectant parent, grandparent, relative, friend these are a must have baby item. I had muslin squares packed in the change bag, in every room in the house, some at Nanny's house and more often than not one draped over my shoulder wherever I went!!! 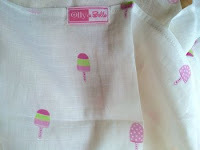 The lovely people at Olly and Belle sent me the lovely lollipop printed muslin swaddle. 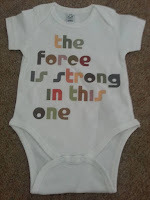 These would be the best baby gift you could buy as they are an essential piece of kit for a new baby. Their super soft 100% cotton baby comfort muslins squares measure 22" x 22" and are ideal for swaddling baby as well as a comforter plus the essential over the shoulder cover for burping baby too! You can find Olly & Belle at www.ollyandbelle.co.uk and you can order the muslins by emailing them via the contact tab on their website. The Extra Large muslin swaddles are £10 each. At Olly & Belle they pride themselves on creating the perfect 100% cotton comfort muslins for parents and babies. They combined super-soft material with classic, unique British designs which babies grow to recognise and love. The comfort muslins are perfectly sized, durable for everyday use and a must have for new parents. Beautiful designs accessorise every outfit, whilst babies and toddlers adore the soft material and silky label. Parents of newborns, babies and toddlers need muslins on a daily basis and Olly and Belle customers regularly praise the product for its super-soft material combined with beautiful prints. Last, but by no means least, is a gift for the new parents. I was lucky enough a few weeks ago to meet the lovely ladies from Honeywell Bakes. Their handmade biscuits are so exquisitely hand crafted and decorated and can be bought for many, many occasions. The new baby/christening biscuits gift box is so sweet. 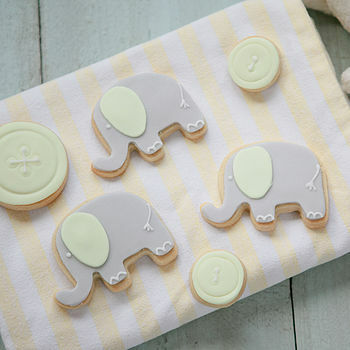 With three each of the elephants and buttons and double the quantity if you go for the larger gift box. We were sent the grey/yellow elephants and there is also other colours to choose from. The biscuits taste lovely, I tried some at a recent press event. The vanilla biscuits are made using local and fairtrade ingredients where possible and the iced deisgns on top are so detailed and extremely cute. The gift boxes start at £20.25 for the Medium set and £26.25 for the Large set (double quantity). As each biscuit is hand made there may be slight variations in each biscuit but this only adds to the unique and wonderful gift for the new parents. They come well wrapped and with the choice of gift card with personalised message. 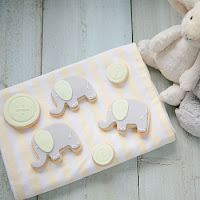 Every new Mum needs some biscuits to keep her energy levels up!. 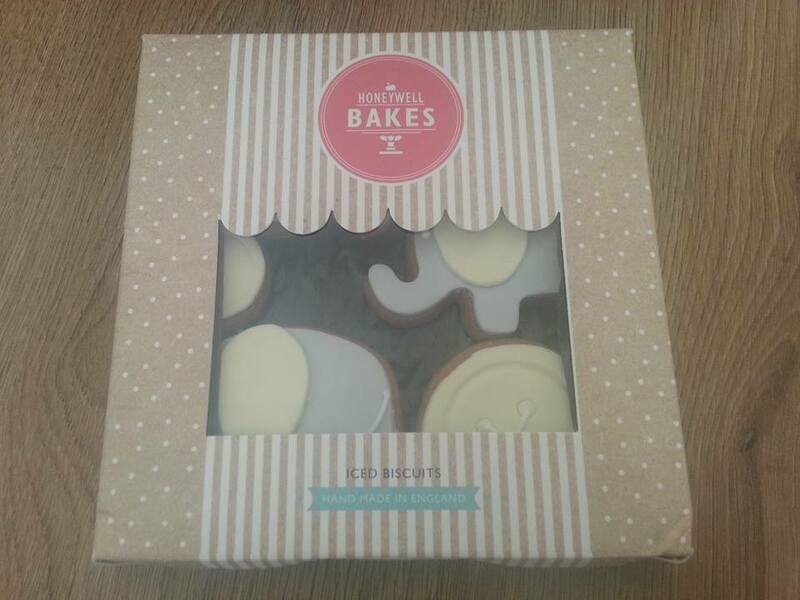 So head to Honeywell Bakes for this lovely gift set and more designs plus other occasions can be found on there too. Now that my youngest is growing up I still try and keep tabs on all of the lovely baby products on the market. 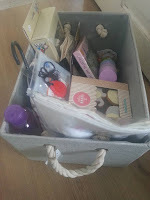 I also love to buy for new babies for both friends and family so it's good to know what to buy when you are putting together a gift basket. Disclaimer; We were sent these items for the purposes of this gift guide. All thoughts and comments are my own. So many fab ideas for gifts! 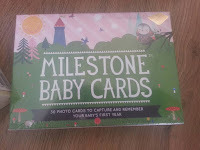 I've started buying the Milestone cards for expectant parents, I have them and love them!